The mountains of Montana donate its name, a Spanish term; montaña which means mountain. There are some 77 mountains ranges within Montana, all part of the vast Rocky Mountain system. The Montana land has been home to many Native Indian tribes. The Crow are in south-central Montana and the Cheyenne in southeast portion of the state. Within the center and northern central region are the tribes of Blackfeet, the Assiniboine and Gros Ventre. To the western end of the large region of Montana were the Salish and Kootenai tribes. The major and smaller tribal groups had the vast region to live in until 1803 with the Louisiana Purchase by the United States. The Lewis and Clark Expedition on its return trip after reaching the Pacific Ocean, traveled a great deal through present-day Montana during July 1806. The only minor conflict with the Indians for the expedition was with the Blackfeet Indians. St. Mary’s Mission was the first permanent white settlement in Montana in 1841. By 1850 Fort Owen was built to served the settlers, Indians and missionaries starting to arrive in the region. 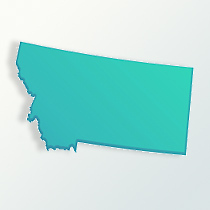 Once gold was discovered in Montana in May 1864, Montana became a United States territory. It would not become a state until November 8, 1889. It was the Indian wars of the 1870s that slowed any massive emigration of settlers to Montana. The most famous being Battle of Little Bighorn in eastern Montana. The defeat of Lt. Colonel George A. Custer and his 7th Cavalry soldiers in June 1876 by the Northern Cheyenne and Lakota made new settlers select other locations to live. Through the 1870s the U. S. military the military attempted to relocate the Northern Cheyenne into Oklahoma Indian Territory. The tribe would not given in to relocation. The persistence of the Northern Cheyenne resulted in the creation of the Northern Cheyenne reservation in Montana. With the railroad systems by the 1880s, settlements in the state were underway. Cattle ranching since the 1850s was an important industry to the region along with agriculture. Wheat farming started slowly in Montana, only replacing oats as the major grain crop after development of new plant strains, techniques, and machinery. A big draw to come to Montana was the Homestead Act of 1862, providing a settler with 160 acres of land. By 1909 the acreage was increased to 320 acres. Thousands of inexperienced homesteaders arrived, lured by free land and high wheat prices, but they were unprepared for the Montana climate, which usually had little rainfall and required special dry farming techniques. At the turn of the 20th century, the Anaconda mine in Butte was the largest copper-producing mine in the world and new emigrates were eager workers. Western Montana had ample timber, but much of the timber near mines was quickly depleted. The greatest surge of population when doing Montana genealogy was in the 1880s. The area went from 39,000 in 1880 to 143,000 in 1890. By 1950 the population was 591,000 and in 2009 Montana is about 975,000 residents. As in other states, those of German ancestry is very high in Montana, as farmers who came in the 1880s. Also, arriving then were the Irish, English, Scots and many from the Scandinavian counties. There are seven Indian reservations throughout Montana with about 7.5 percent of the population in the state classified natives. In Montana and South Dakota are the highest percentage of the German Hutterite people. They are a communal group, sharing in community goods and services. Three groups totaling 1,265 individuals migrated to North America between 1874 and 1879 from Europe. The Dariusleut group were established themselves in central Montana. Overall, the white population in Montana is about 92.5 percent and the African-Americans are only .6 percent. The Billings, Montana area has many Hispanics, especially from Mexico, but whose families came to the region in the 19th century.